The first record we have of ownership of Patterdale Hall dates back to 1624, when the Lordship of Patterdale was purchased from the Threlkeld Family by Joan Mounsey of Greystoke for her son John, a miner. The Threlkelds were said to have had a house present on the site for many hundreds of years before this, but of this we know nothing. During the Civil War, John Mounsey led a group of Dalesmen (men from the Dales) to Stybarrow crag to repulse the Scots, who were on their way to fight for Charles I at Preston. It appears that after this exploit the great John Mounsey became known as the “King of Patterdale”. John Mounsey and his wife Dorothy rebuilt their old house in 1677 during a period of greater prosperity. Many houses in the Lake District were rebuilt at this time. A sketch plan by an antiquarian called Machell, drawn about 1680, shows the house with as cross-passage, a communal hall, kitchen, buttery and parlour i.e. a bedroom for the master and the mistress. There were also stables, a walled courtyard, terrace and orchard. The house was probably furnished with finely carved wooden furniture, a feature of the Lake District homes at that time. Certainly a throne for the king was made, bearing his initials, coat of arms and the date 1677. This chair is now in the Tullie Museum, Carlisle. Before John’s son, another John, died in 1725, the house had been extended by a single storey addition and the main rooms had been ceiled over to make storage and possibly sleeping accommodation. A later John Mounsey, probably the grandson of the second John, was said to be a great miser who allowed the property to fall into decay, although an engraving of 1788 shows what appears to be a fine Lake District house. When he died in 1793, his son John refurbished the house, and added the South Wing in 1796. John Mounsey died in 1821 and his considerable estate was divided among his many children. His son and his wife were left only the Hall and the stock at Grisledale Farm, and had to provide two of his sisters with £1,000 each. He sold the Hall to John Marshall, a wealthy linen manufacturer of Headingley, Leeds. 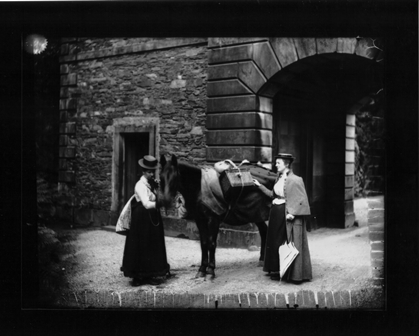 John Marshall, the new owner, was married to Jane Pollard, a good friend of Dorothy Wordsworth. When their eldest son William lived at Patterdale Hall, Dorothy’s even more renowned brother William Wordsworth stayed on a number of occasions. It was whilst staying a Patterdale Hall that he is rumoured to have conceived his most famous Lake District poem. In 1848, William Marshall employed a well-known architect, Anthony Salvine, to design a much grander house. This appears to have entailed demolishing most of the older house except for the newer south wing addition of 1796, along with the original dripstone moulding, which bears John and Dorothy Mounsey’s initials and the date 1677 (and can still be seen today). A tapestry sampler was made in 1852 by Agnes Martin of Matterdale (and now owned by her great granddaughter Mrs E Weaver of Auckland, New Zealand) which shows the Northern elevation of the new house, with the door centrally placed. The archway wing is not shown, and may have been a later addition. The Marshalls terraced and landscaped the grounds, laying out formal gardens and planting many exotic and newly discovered trees. Walks were also laid out in the woodlands, including a wilderness walk. The occasional shrub which remains is now overgrown with Portugal laurel, rhododendron, sycamore, oak and birch. William Marshall was succeeded at the Hall by his three sons in turn. The last, Walter James, was High Sherrif of Westmorland in 1890. He was one of those interested in building a branch railway to Pooley Bridge: a scheme that never came to fruition. 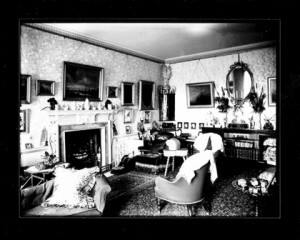 The last of the Marshalls to occupy the Hall as a family home was William Hibbert, who died in 1929. After his death the Estate was put on the market, the contents auctioned in 1934, and the Hall and Estate sold in 1937 to F.C Scott. F.C. 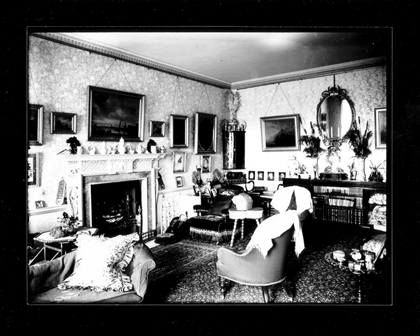 Scott did not occupy the house and during the Second World War it was at one stage occupied by evacuees, and at another requisitioned by the army, when various alterations were made. With the war over, the Hall and the Estate were purchased in 1950 by Rowland Lishman, a Tyneside businessman who was also a long-serving member of the North Shields YMCA. He placed the whole Estate in trust of the Tynemouth YMCA. 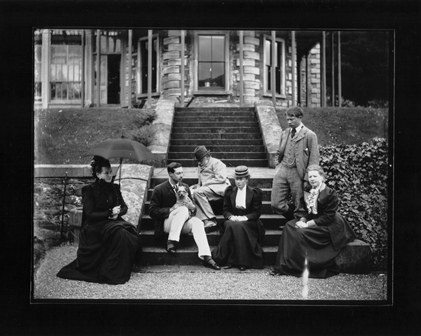 His aim was to provide holiday accommodation at a reasonable price with the emphasis on young people from urban areas, to enable them to experience the unique qualities of the Lake District. In 1988 the management of the trust transferred to the North Shields YMCA, with whom it rests today. 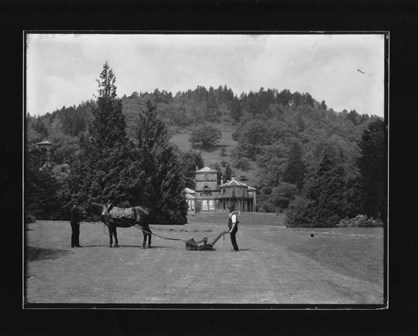 The Estate trades under the name “Patterdale Hall Estate”. The Estate, now approximately 300 acres has seen various pieces sold off over the years. It now consists of the Hall; 16 self-catering holiday homes; a tenanted working hill farm; and 100 acres of picturesque woodland and gardens. The Hall started to be used as group base for outdoor pursuits and enjoyment of the countryside in the mid 1950’s by the YMCA. Later the hall was leased out to Oxfordshire County Council, who established a residential base for the young people of Oxford. 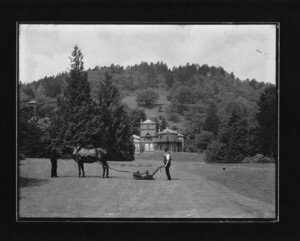 In 1995 the Hall, along with a portion of the stables and boat houses, was leased to Bolton School to become the site of the main part of their Outdoor Pursuits Curriculum. Nineteen years on in July 2014, Bolton School completed a purchase of the Hall Buildings, gardens and about 80 acres of estate land. The School continues to make great use of the hall for Curriculum Adventure Learning courses and a broad range of extra-curricular experiences and opportunities, ranging from the Duke of Edinburgh’s Award expeditions to Creative Writing courses and German Study weekends. When not working with Bolton School groups, Patterdale Hall accommodates many other groups for residential and outdoor learning experiences.